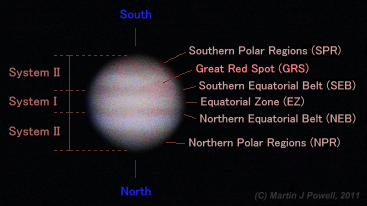 Jupiter is one of the most rewarding planets to observe through a telescope. Its rapid rotation and ever-changing cloud patterns mean there is always something worthwhile observing or monitoring. The images of the planet seen here were filmed by pointing a video camera through the eyepiece of an 8-inch reflecting telescope in February 2004. The image is inverted (South up) which is the standard orientation of most astronomical telescopes. The rippling effect simulates how the Earth's turbulent atmosphere (the 'seeing conditions') affects the steadiness and quality of the telescopic image. The diagram here (78 KB) shows the primary features of the planet which one can expect to see through small telescopes. With patience, considerably more detail can be seen depending upon the telescope aperture and the local atmospheric seeing conditions.